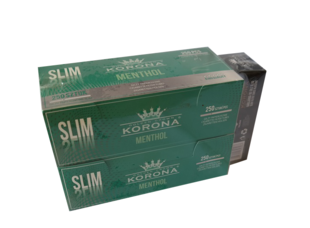 Boxes of 500 Menthol tubes KORONA SLIM + GRATIS Cigarette Tube Machine. Universal, equipped with a menthol capsule. Simply fill them with tobacco to make your own cigarettes in seconds! Use them with our tubing machines.